Glasgow International Airport (sometimes referred to as Glasgow Abbotsinch International Airport), located 13 km (8 miles) west of Glasgow, near the towns of Paisley and Renfrew, is the largest international airport in Scotland, and number five in the UK. Its IATA Airport Code is GLA, while its ICAO airport code is EGPF. 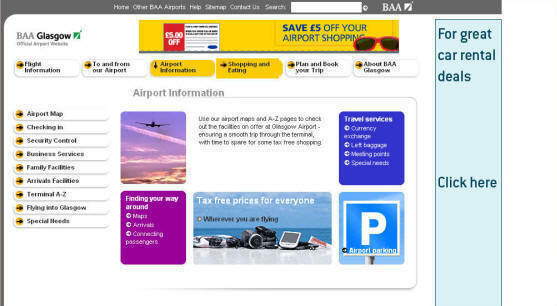 The airport is owned by BAA plc, which also owns London Heathrow Airport, London Gatwick Airport, London Stansted Airport, Edinburgh International Airport, Aberdeen Airport and Southampton Airport. The history of Glasgow Airport goes back to 1932, when the current site at Abbotsinch was used as an overspill airfield for the adjacent RAF base. The original site of Glasgow's "main" airport was 3 km (2 miles) east, in what is now the Dean Park area of Renfrew. In the 1960s, Glasgow Corporation decided that a new airport for the city be constructed at Abbotsinch. It was a controversial plan, as central government had already committed millions into rebuilding Prestwick Airport fit for the "jet age". Nevertheless, the plan went forward and the new airport, designed by Basil Spence, was completed in 1966, with British European Airways beginning services using De Havilland Comet aircraft. The political rows over Glasgow and Prestwick airports continued, with Prestwick enjoying a monopoly over transatlantic traffic, while Glasgow was only allowed to handle domestic and intra-European traffic. An extended terminal building was created by building the new structure so that the old terminal is actually inside it. The original concrete arches which looked onto the roadside now form the facade of the check-in area. Glasgow Airport now has 33 gates, bringing its capacity up to seven million passengers per year. In 2003, BAA announced that it was extending the St. Andrews Building, thus creating a "Terminal 2", the capacity need fuelled by the explosion of "no-frills" airlines. Glasgow is hampered against future growth by its location, which is constrained by the M8 motorway to the south, the town of Renfrew to the east, and the River Clyde to the north. At present the towns of Clydebank, Bearsden and Linwood all sit directly underneath the approach paths into the airport, meaning that further increases in traffic will be frowned upon. Politicians are looking at Edinburgh Airport as the more likely recipient of major investment. Glasgow also faces stiff competition from its old adversary at Prestwick, which has reinvented itself as a low-cost hub for budget airlines. Prestwick Airport is also stronger as it has a direct railway service straight to the terminal from Glasgow city centre, which ironically passes through Paisley Gilmour Street Railway Station, the place where passengers have to change to a connecting bus to get to Glasgow Airport. However, the Scottish Executive announced in 2002 that a rail link from Glasgow Central would extend out to Glasgow Airport. Currently, the airport is easily accessed by road due to the adjoining M8 motorway and is served by a frequent dedicated express bus from the city centre. The airport is home to Scottish regional airline Loganair, a British Airways franchise operator, who have hangar facilities as well as their head office located on site. British Airways itself has a maintenance hanger at the airport, capable of carrying out overhaul work on Airbus A320 and Boeing 737 aircraft, as well as a cargo facility. Glasgow is also the main base for Flyglobespan and Air Scotland, though these carriers do not have major facilities on the airfield. In addition to the scheduled services listed above, a number of holiday companies operate exclusive charter flights from Glasgow to a number of destinations in Europe, North America and Africa. The popular resorts of the Mediterranean, Canary Islands, Cyprus, the Greek Islands and Florida form the majority of destinations for these flights. A number of airlines operate holiday flights from Glasgow, including First Choice Airways, Britannia Airways, Excel Airways, Thomas Cook Airlines, My Travel, Monarch Airlines, Futura Airlines, Spanair and Balkan Holidays.